The SEC brought charges against Joseph Meli, Matthew Harriton, and companies they were connected with, on the basis that they were running a Ponzi scheme fraud. According to the SEC, the defendants raised $97 million from at least 138 investors in 17 states, under the guise that the money was being invested into businesses with the purpose of purchasing and reselling tickets to highly in-demand live theater and concert events. 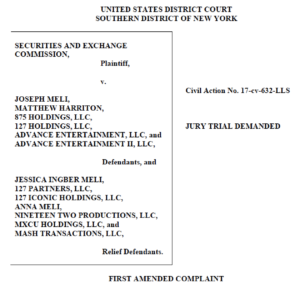 The SEC alleged that specific defendants misled investors into believing that their money would be pooled to purchase large blocks of hard to get tickets for shows, and that the defendants had arrangements with the producers of those shows to obtain tickets. 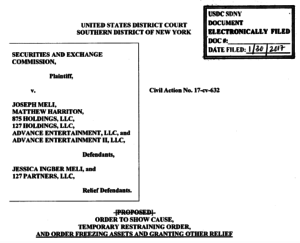 The SEC claimed that those defendants misrepresented that they had agreements with certain producers to purchase hundreds of thousands of tickets to shows such as “Hamilton” and “Harry Potter and the Cursed Child”, when, in fact, no agreements ever existed and no tickets were ever purchased. On January 30, 2017 the court entered a Temporary Restraining Order that, among other things, preliminarily enjoined the defendants from continuing their misconduct, prohibited the defendants from accepting investors’ funds, froze the defendants’ U.S. assets, and required the defendants to provide verified accountings of their assets. Subsequently, the SEC amended its court complaint to increase the amount involved in the Ponzi scheme fraud to $150 million. In addition to naming five additional relief defendants, the SEC also expanded the scope of its fraud case against the two individuals it originally charged with orchestrating the plan. As described in the Amended Complaint, Meli and Harriton used $59 million that they received from new investors to pay prior investors. Millions more were purportedly diverted to enrich Meli and Harriton. Among other things, the SEC alleged that Harriton was paid $1.3 million and Meli withdrew $1.5 million from corporate bank accounts for their own personal use. Meli also supposedly used the corporate bank accounts to fund personal expenses such as retail purchases, school and camp tuitions, casino expanses, travel, payments to professional services firms, and other things, totaling $6.8 million. In its original court complaint, the SEC had previously named Meli’s wife and one of his companies as relief defendants. In its Amended Complaint, the SEC also named Meli’s mother, two of his companies, and two companies owned by Harriton, as relief defendants because they allegedly received investor funds from the Ponzi scheme fraud. Together, the SEC alleges that the seven relief defendants obtained over $2.5 million of investor monies, in addition to $3 million of investor funds used to purchase a home in Meli’s wife’s name.